This month’s theme of the journal Chronicles of Narrative Medicine is measurement and I was asked to address how listening and communication in the doctor-patient relationship is measured. This theme may seem simple, but the search for sources and studies on the subject has proved more complex than expected. Speaking of measurements and evaluations, the first idea was to query the most famous database of scientific articles, PubMed, and verify what was already published on the subject and what were the most used methodologies. This research allowed me to find four types of articles that deal with the subject and for this reason, I decided to share with you my journey into literature. There have been many articles in which doctor-patient communication is addressed as a case study and then narrated in the form of best, or worst, practice. These articles are interesting in themselves and have a great impact in raising awareness on the theme of good communication. Among these, extremely interesting research has highlighted 7 strategies told by doctors who have learned to improve their communication skills. In this study, physicians were evaluated by their patients through satisfaction questionnaires and only later did the researchers realize that some of them had an increase in score over time. In particular, seven different events that changed their way of communicating were described by these doctors: a listening tool, a path of awareness, the search for new meanings in clinical practice, a technological tool, a sudden intuition, an observation by the mentor, and a doctor-patient experience. This article allows us to understand that listening and understanding can be learned at any time in our lives, but it does not give us a reference for measuring communication and listening. Going forward with the research on PubMed, therefore, many articles recommend techniques and methods of communication ranging from mindfulness, to teach-back. These papers usually recommend techniques and approaches to be put into practice during clinical practice, but they are often related to patients with specific diseases and no measurements are made. The first category of articles that actually measures doctor-patient communication involves timing visits, see for example how many minutes out of the total number of visits are reserved for patient communication or questions, or after how long a doctor interrupts the patient in his explanations. These articles, of which we have also spoken previously in our journal (http://www.medicinanarrativa.eu/lo-dellarte-delle-metodologie-narrative-sanita), certainly allow us to have an initial measure of what is happening in clinical practice. Negative results are indicators of an ineffective relationship: for example, knowing that on average the doctor interrupts the patient after 22 seconds allows you to have data to make health professionals understand the importance of a training course on communication. Reading these articles, however, I asked myself a question: what about the positive results? Does the simple measurement of time allow us to be sure that the person has actually been heard? To make you understand my doubt, I will give you a simple example. I had just started my studies at university and for some knee problems, I went for an orthopaedic visit. I book a private visit with a specialist who is highly recommended by a relative and when I arrive at the centre I find a very young doctor who welcomes me kindly and makes me sit down to ask me some questions. During the visit, he never asked me what I was studying at the university, but he spent most of his time asking me about the type of physical activity I was doing, about previous illnesses, about the shoes I was wearing every day. Each time I got an answer, I would take advice, and up to that point, I had thought that this time I had found a really attentive person. The end of the visit comes after having done a series of exams and an ultrasound, together with my mother, makes us comfortable and tells us what he thinks is the outcome and the therapy that I should follow. At this stage, the idyll of the visit shatters: the doctor begins to use only scientific terms and it seems that he is working to make us understand absolutely nothing. I, who had just passed the anatomy and physiology tests, understood what he was talking about, but surely the doctor could not know that. Remembering that episode today I would say that if someone had actually measured the time in which the doctor listened to me the results would have been positive, but I certainly did not come out satisfied with the way of communication. The results of this research showed that 40-66% of the women interviewed had difficulty communicating with the hospital team during the prenatal period and about 24% of the women reported having suffered discrimination during their stay in the hospital for childbirth. These results certainly reflect and highlight the patients’ perception of communication with their doctor, but once again they do not provide a clear methodology for measuring and evaluating listening, especially to understand how to identify effective listening practices. Going forward in the search to find an answer to my doubt, an article that I particularly appreciated and that allowed to measure effective ways of communication is that of Tallman K et al. This group of American researchers recorded 92 video visits with general practitioners; patients reviewed the recordings with a research assistant to get comments on the visit describing aspects of the communication that turned out to be “new, different, or whatever [they] liked or didn’t like about the communication”. By correlating the analysis of the recordings with the level of satisfaction perceived by the patients, the researchers were able to create a model of good practice for effective communication. In particular, the behaviors related to increased satisfaction perceived by patients are: focus on the patient’s program, trace the history, demonstrate understanding, provide detailed explanations and, finally, complete the patient’s program. 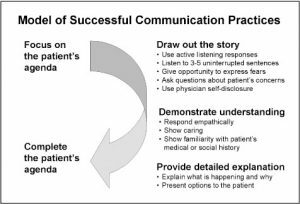 In this case, researchers started from observing the reality of clinical practice to model effective communication practices, without imposing predetermined communication theories. This article, however, still does not provide a precise metric for evaluating communication and listening. The search for an answer to how listening can be measured during medical examinations was finally found in a 2017 article by Giambra and colleagues. In this study, the researchers applied the “Theory of Shared Communication” which was developed to discover the perceptions of parents and nurses about the communication process leading to the mutual understanding of the plan of care of the child in hospitalization. In conclusion, this literature research has allowed me to highlight the fact that there are few metrics used to measure listening and communication, while there are many methods recommended to improve it. From all the studies analysed, communication difficulties emerge regardless of whether the care professional is a specialist, a general practitioner or a nurse. In this article published this month in Chronicles of Narrative Medicine you will find some advice written by Maria Giulia Marini and Giorgio Bardellini on the importance of listening and how to measure it in daily practice. The communication difficulties observed through this analysis are exacerbated if the patients have a different origin from that of their caregiver and the literature, especially in recent years, is dotted with studies that address the problem of communication between different cultures at the medical level. For this reason, the March issue will have as its theme the communication with different cultures, so soon for the next trip in literature. Janisse T, Tallman K. Can All Doctors Be Like This? Seven Stories of Communication Transformation Told by Physicians Rated Highest by Patients. Perm J. 2017;21:16-097. Prince-Paul M, Kelley C. Mindful Communication: Being Present. Semin Oncol Nurs. 2017 Dec;33(5):475-482. Badaczewski A, Bauman LJ, Blank AE, et al. Relationship between Teach-back and patient-centered communication in primary care pediatric encounters. Patient Educ Couns. 2017;100(7):1345-1352. Attanasio L, Kozhimannil KB. Patient-reported Communication Quality and Perceived Discrimination in Maternity Care. Med Care. 2015;53(10):863-71. Tallman K, Janisse T, Frankel RM, Sung SH, Krupat E, Hsu JT. Communication practices of physicians with high patient-satisfaction ratings. Perm J. 2007;11(1):19-29. Giambra BK, Haas SM, Britto MT, Lipstein EA. Exploration of Parent-Provider Communication During Clinic Visits for Children With Chronic Conditions. J Pediatr Health Care. 2017;32(1):21-28. Giambra BK, Sabourin T, Broome ME, Buelow J. The Theory of Shared Communication: How parents of technology-dependent children communicate with nurses on the inpatient unit. Journal of Pediatric Nursing. 2014;29(1):14–22. Dr. Antonietta Cappuccio is presently Working as a Project Manager and Researcher in the Healthcare Area of ISTUD Foundation with particular expertise in Narrative Medicine and Qualitative research analisys. After a degree in pharmaceutical biotechnology at the University of Padua and a brief experience in research at the University of Lausanne, she attended the master "Scientists in Company” of ISTUD Foundation, through which she became familiar with the projects carried out by the Healthcare Area. Currently involved in research projects on healthcare and to deepen the knowledge of the Narrative Medicine, not only analyzing the stories of patients, caregivers and medical team, but also echoing this new approach to the doctor-patient relationship.